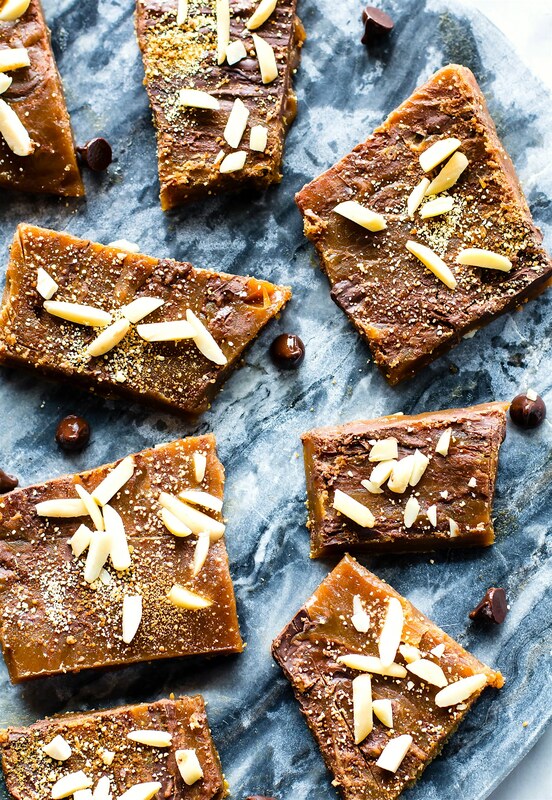 This maple candy (toffee) is made with just 5 simple ingredients, plus your favorite topping. A paleo and gluten free candy recipe made with real butter, maple syrup, and dark chocolate. 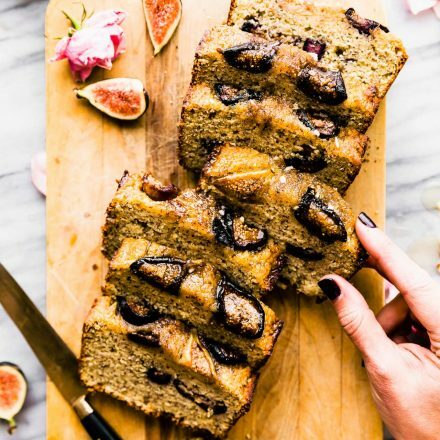 Delicious sweet treat to get you through the holidays. Actually, it’s just good ANYTIME! Makes great holiday food gifts, too. Hold the phone…. I’m posting a 5 Ingredient paleo maple candy recipe less than a week after tropical banana soft serve. Well, geeze. Just shows how off I am this week. Holidays that are between seasons throw me off. Do I eat pumpkin? Even thought it’s 90F? Or do I keep drinking mojito smoothies until we reach September 23rd and a crisp cool 85F? LOL! First world problems. In all honesty, I think this is the best time to ENJOY both. End of summer fruit and SO close to Fall spices/flavors. You get variety and comfort at the same time. Which leads me to this maple candy recipe. Uh… can I just call this crack toffee? Yes, let’s go with it. It’s addicting in the best way possible. Paleo and gluten free candy it is, sure, but I won’t lie, it’s no superfood. Just super delicious. Actually, come to think of it, maple and butter and superfoods. I’ll explain my reasoning in a minute. But first. A STORY! True story, once upon a time there was a young blog girl who grew up with 3 brothers. They often dared her to do stuff. Like eat WHOLE sticks of butter in one sitting. Ahem… that girl was me. The only problem was that after I accepted the dare and ate the stick of butter, I realized that I REALLY liked butter. In fact, I continued to eat slabs of butter with cinnamon sugar or maple syrup on top. Obviously this was without my mom knowing. In fact, I don’t think she know now. Haha, whoops. Maybe I’m really Paula Dean’s long lost daughter? I kid. Honestly, I never had any health issues growing up. I was quite active and healthy. I guess you could say my life life motto back then was “fueled by butter!” Haha. Point being friends, REAL butter is magical (if well tolerated). And if fact, it can be a healthy addition to the diet. Just don’t eat the whole stick in one sitting like I did. 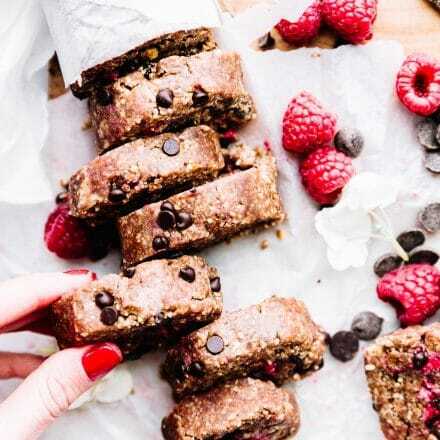 Instead focus on using it recipes or a little bit here or there for individual servings.. Also, Dairy Free Ghee, Grass-fed, or even the new coconut oil based vegan butters work wonders as well! Oh the natural healthy fats make me swoon! Yes I am going there. BUT… only so I can justify the 5 ingredient paleo maple toffee addiction. Cool? 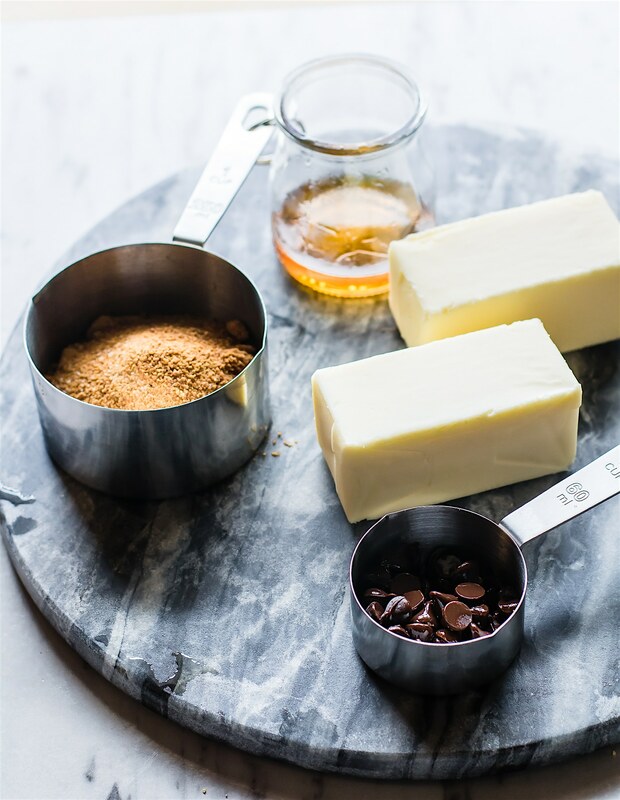 Butter contains healthy fat soluble vitamins. Vitamin k2 in particular. Remember my love for Vitamin K in the Brussel Sprouts recipe? Yes, it’s so needed. But Vitamin K2 does wonders for calcium metabolism. Butter contains a two pretty AMAZING fatty acids. One is called butyrate and the other Conjugated Linoleic Acid (CLA). Both contain anti-inflammatory properties (source), but what I love about butryate (I may be bias) is that is can help with your digestive system by regulating proper cell growth or “balance” of good/bad cells in the lining of the gut. Don’t worry, I won’t get any more nerdy on you. Just had to hare those two tidbits. Like I said, maybe those healthy facts justify my reasoning for sticks of butter as a young child. I’m one big BUTTER LOVING machine now! Okay, now let’s discuss how 5 ingredient maple candy can fit in here. Um…. can you tell by the picture below? Today’s paleo and gluten free maple candy is my ode to butter. With a little bit of dark chocolate and coconut sugar mixed in. You diggin it? 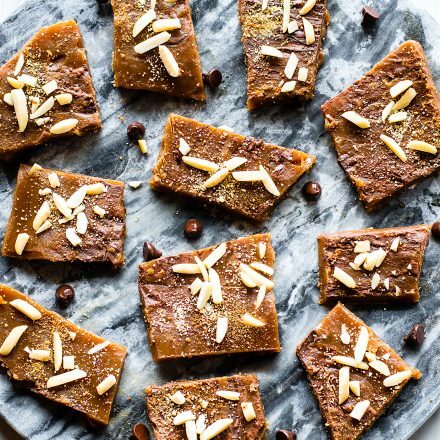 All you need are 5 ingredients and a lot of LOVE for healthy snacks and desserts to make the recipe for maple candy. Although… I won’t lie. 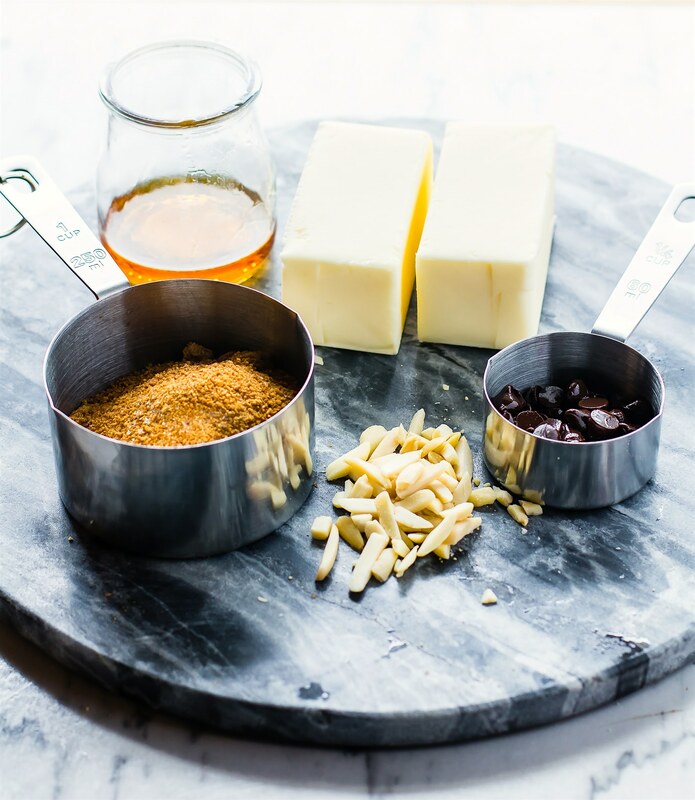 IF.. and only IF you want a topping, then this will make it a 6 ingredient toffee. 5 or 6, meh. Same thing right? Does water count as an ingredient? Ugh, you get my point. Still, butter is INVOLVED. YEA! Personally, I liked adding a little coconut sugar and crushed almond on top. For Crunch factor. Hello, my blog is Cotter Crunch. You can quote me on that. Obviously, you don’t have to add any topping. I will leave that up to you. So what does it take to make this toffee? Mmmm… just 15 minutes and then bam, in the fridge it goes. What temperature do you cook maple candy? One tip –> to perfect the chewy toffee texture, I highly recommend using a candy thermometer or a thermometer that reaches 330- 350F. You’ll be cooking the maple candy at 285 until it turns dark amber in color. When it cools and hardens, it becomes toffee! Let’s get to it. You’re gonna love this maple candy toffee! Super easy and great for holidays! 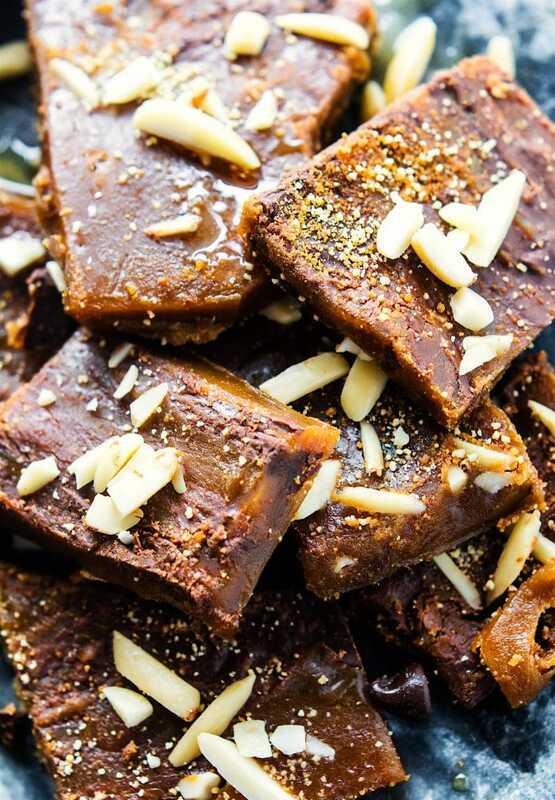 Maple candy toffee made with 5 ingredients plus your favorite topping! With real butter, maple syrup, and dark chocolate This gluten free candy is so easy to make, and it makes a great holiday food gift. 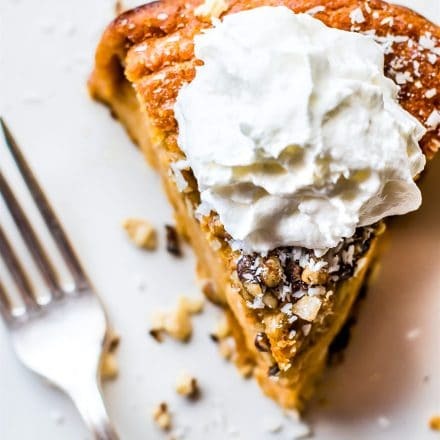 Optional toppings or add-ins if desired – crushed nuts, cinnamon, vanilla, etc. First make sure your butter is softened somewhat. This speeds up the process. In a medium pot, combine your butter, sugar, maple syrup, and water. Mix on stove top on medium heat until sugar is dissolved into butter. Increase heat to medium high until you reach a boil. Don’t boil too high or too long otherwise your sugar will burn. Reduce to medium or at 285F, somewhat of a soft boil. Continue to cook, whisking constantly, about 10-15 minutes. Be careful to watch the pot so the butter doesn’t overflow. If it starts too, just lift pot with pot holder for a second then place back down. The liquid boil will be nice dark amber color once done. Carefully pour the hot mixture onto a baking tray lined with parchment paper. Spread it around evenly. Pour your dark chocolate chips on top. The chocolate will start to melt with mixture. Spread the melted dark chocolate around evenly with spatula. Add any other topping you’d like. Crushed nuts, salt, cinnamon, vanilla, etc. Spread it around the pan as well. Place in fridge for 2 hrs. Once hardened, remove from fridge and cut into pieces. I like to add a little coconut sugar on top to make it more “sticky.” This is optional. Store in air tight container or ziplock bag. I keep mine in fridge to last longer but room temperature is fine as well. If you don’t have a thermometer, just be sure to continue whisking at soft boil for at least 10-12 minutes. This is a good basic toffee recipe. You can add in vanilla extract, spices, nuts, cranberries, etc! Be careful when cooking; you don’t want butter/sugar mixture to boil over. It’s very HOT when you pour onto baking sheet, so do so gently. You can use brown sugar or raw sugar in place of coconut sugar, but it will not be paleo. If you want STICKY toffee, just drizzle with a little extra maple syrup or coconut sugar. Oh so bad yet so good, right? Confess.. did you love butter as much as I did growing up? Are you ready for so all the holiday shenanigans and treats? 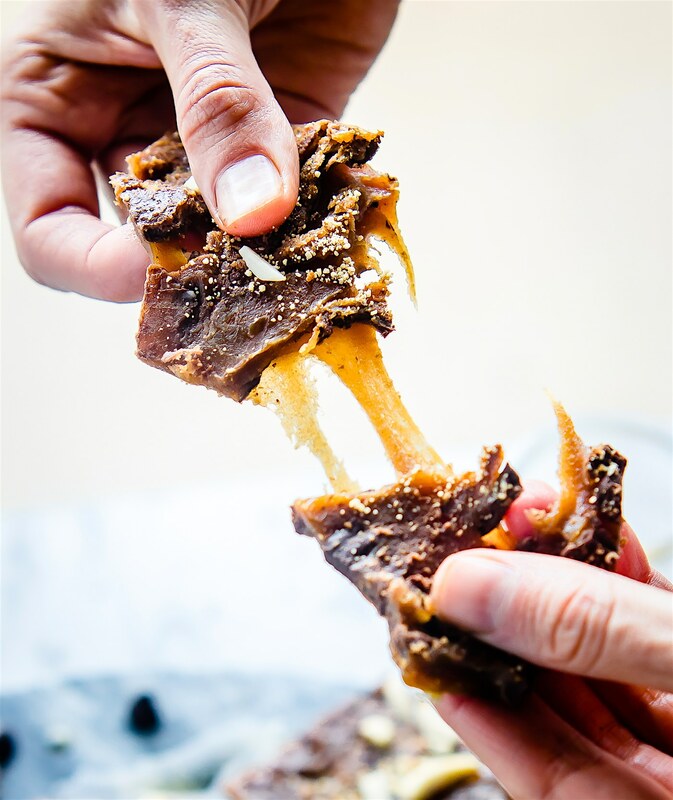 If you are, make it PALEO MAPLE CANDY TOFFEE! 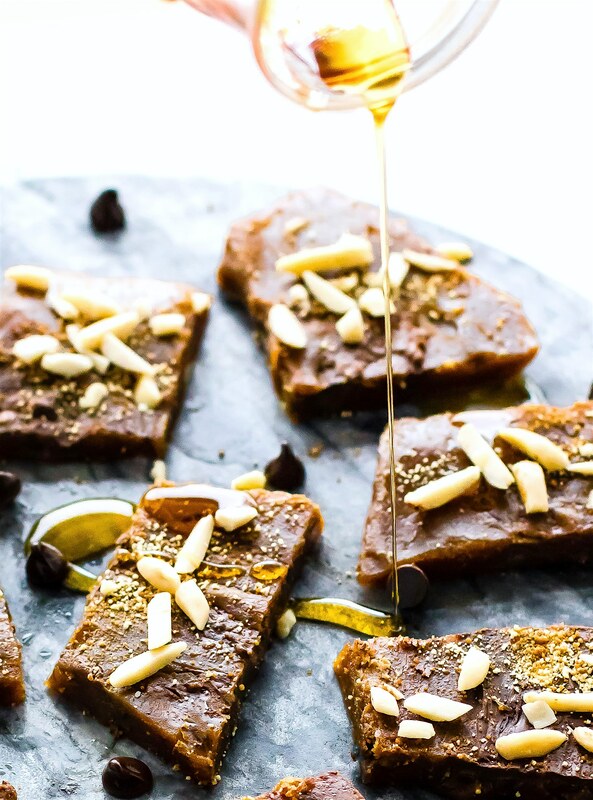 This #Paleo Maple Candy Toffee is made with just 5 ingredients. Healthier and EASY to make and perfect for holiday food gifts! The struggle is definitely real! I made pumpkin muffins in 100 degrees the other day and had zero desire to eat them. Going in the freezer for a rainy day! Guess I need to get creative like you! I can’t believe that ingredient list is only all of five ingredients! 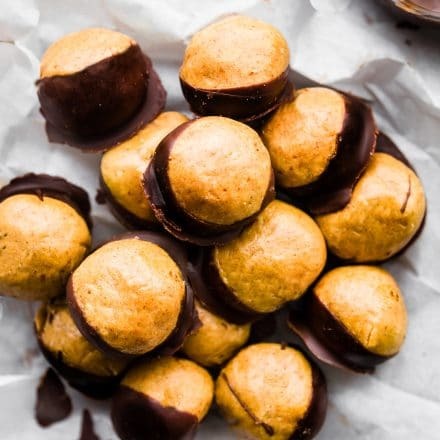 These sound amazing and would be so perfect for the holidays! Ready for the holidays! And this toffee – WOW! I need it, and I will definitely make it! True story – this is my favorite Christmas dessert. My friend Ben used to come by every Christmas Eve with a giant bag of the most delicious toffee ever (besides yours, that is) and we’d chow down on that for the 22.5 hours it lasted. I’m ready for some holiday treats! But for now… yeah, I’m making watermelon-vodka slushies in the blender. I need your smoothie next! Let’s escape to either the beach or mountains. K? hehe, thanks friend. I heart butter. My brothers laugh now. That looks delicious! And I love treats that don’t require a lot of ingredients! Ummmmmmmm. I’m pretty sure this is amazing. I need a huge big batch of this for myself and I need to package up plenty of other batches for all the people who I love as this would make an awesome gift too! You are amazing, girl! I definitely thought toffee would be more complicated to make. Happy to find out that it’s not. Remember butter sandwiches? And yes, real butter is indeed amazing! Too bad it makes my stomach go WTF? But at least I can have a little bit! 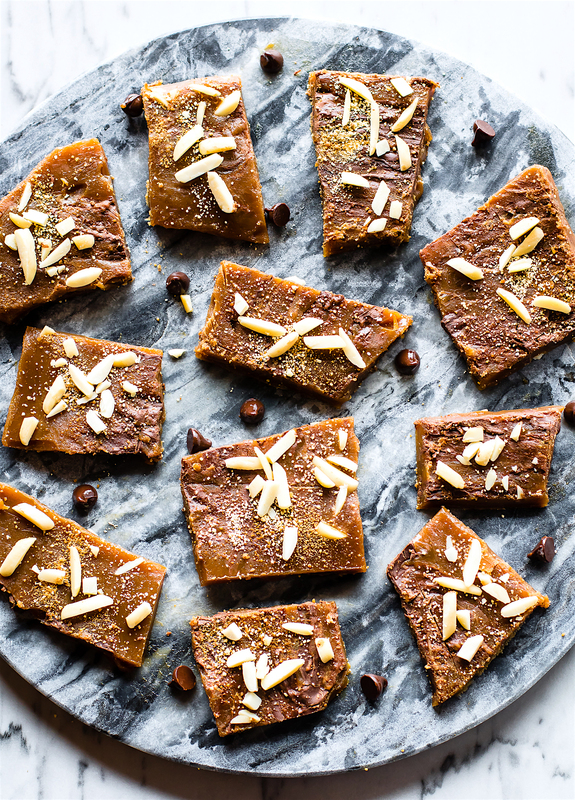 Lindsay, my mom used to make “milk toffee” all the time when I was younger – looking back, it’s been ages since I had some and your paleo toffee sounds downright drool-worthy! Gorgeous photos too, my friend! And now I know that butter ha anti-inflammatory properties! Omg I would have done same!! Cookie dough love!! You should toss this is a Cotter Christmas post. So goofs like me can rind it again and make it! Hah I will! P.s this toffee is going to be part of a healthy bite recipe.. oh stayed tuned! pps how are you feeling? This toffee is amazing. 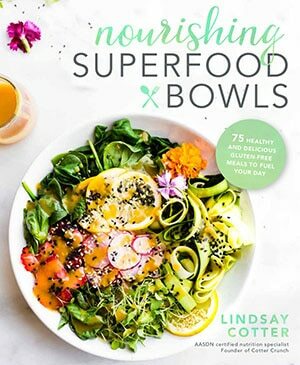 Looks like a healthy version of one my Mom use to make. Can’t wait to make it. Julia Child loved butter! man I wish that was healthy. haha i miss it. Wanna know another funny story? That same butter-loving girl would be me too! 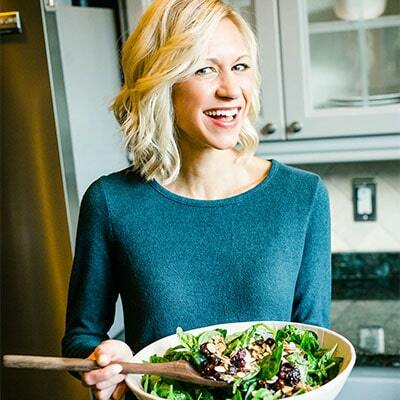 I wouldn’t quite eat a whole stick but that was only because I always got caught by the superfitmom and get warned about the acne butter causes! LOL! OMG i love this story! Buttah Twin! This ode to butter (and toffee of course) made my day. Blows kiss. So delicious! Reminds me of the saltine cracker toffee my grandma made during the holidays when I was a kid! This I am sure would be much, much better! Very interesting blog. A lot of blogs I see these days don’t really provide anything that much interesting, but I’m most definitely interested in this one. Just thought that I would post and let you know. I was really excited to make this today for holiday gifts. A triple batch even! The candy thermometer I bought seemed to be defective because I could not get it past 250 even though the mixture was clearly at a fast boil, and then a slow boil. So I did the best I could based on observing the mixture rather than the temp. Unfortunately the finished toffee will not harden. Even after many hours refrigeration, it’s still just gooey. Wondering if you have had any experience with that happening, and ideas about what might have gone wrong. Perhaps I poured it too thick? Or perhaps it just never got hot enough. Maybe tripling the recipe had something to do with it? I can’t stand to let all these premium ingredients go to waste so I plan to make balls of the toffee and dip them in dark chocolate. It just won’t be nearly as pretty. Thanks for the recipe and any suggestions you might have! Hi Nicole! So sorry to hear about this. Bummer! I think doubling might have to do with the texture. That’s tricky. I usually try to get my thermometer up to 240F if not 250F. 220 is soft candy. It could have been too much butter too. oops I meant 240F for caramel sauce, not toffee. SO that’s why it probably didn’t set. Feel free to email me if you need help! I made this recipe over the weekend for a neighbor that loves toffee. It was crazy how much it tastes like the real deal! The only thing different is the fact that it is not crunchy, but honestly your teeth will thank you for that. The recipe was easy as long as you follow it and stir vigorously for 10-15 minutes. No slacking off here! The payoff is well worth it. Thanks for such a great recipe, I’m saving this one for the holidays! Oh yay! So glad. I adore it too. haha kinda like toffee, taffy, and everything between. Ghee is not dairy free. There are still milk proteins left in it that some people react to or have issue with. Usually lactose intolerant people do fine with it but those with a dairy allergy do not. Very true! Thanks for catching that. I will correct.